This salad is light, and tasty with so many fresh flavors. 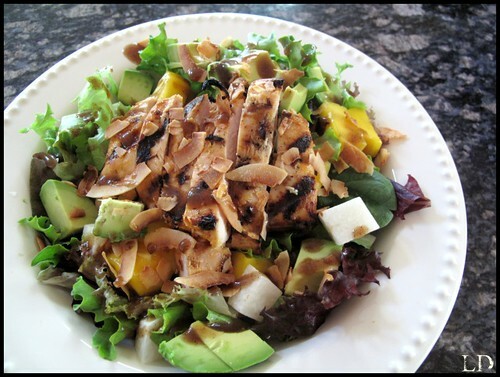 The fresh mango is a must in this salad, it's so sweet and tropical. Also, do not be scared by the red chili sauce it just gives a hint of heat, balancing out all of the yummy sweetness going on. I like making this salad on those really hot summer days, when cooking just seems like a burden. This salad also makes a fantastic lunch. Place your chicken breasts in a large ziplock bag, slightly pound your chicken with a heavy meat tenderizer, set aside. In a medium bowl add your mango or apricot preserve, sriracha, and olive oil. Mix throughly and pour over chicken in the zip lock bag. Let your chicken marinade for at least 2 hours or over night. (sometimes I reserve just a little bit of this sauce and baste my chicken with it while cooking) After your chicken has marinaded, grill your chicken until throughly cooked. When cooled dice into strips. Dice your avocado, and jicama, set aside. On a cookie sheet spread out your coconut and bake at 350˙bake until golden brown. This only takes about 2 minutes. When finished assemble your salad. I serve this salad with balsamic vinaigrette.